Alex Wong/Getty ImagesFacebook CEO Mark Zuckerberg on Capitol Hill before a meeting with Sen. John Thune of South Dakota on Monday. 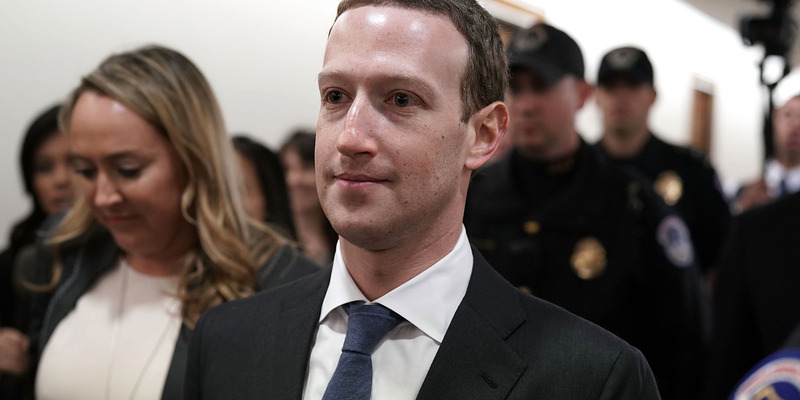 Facebook CEO Mark Zuckerberg is scheduled to give two days of congressional testimony on Capitol Hill related to the Cambridge Analytica data scandal. Shares of Facebook were up 0.88% ahead of Monday’s opening bell. Facebook has seen about $US79 billion of market cap wiped out since news of the scandal broke. Watch Facebook in real time here. 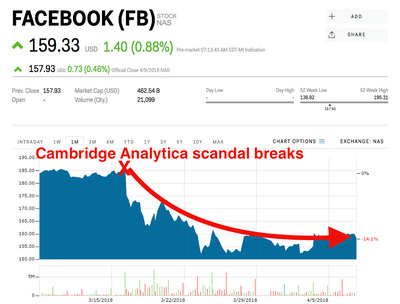 Shares of Facebook are ticking higher, up 0.88% at $US159.33, ahead of CEO Mark Zuckerberg’s congressional testimony on the Cambridge Analytica data scandal. Zuckerberg is scheduled to appear before a joint hearing of the Senate Judiciary and Commerce committees Tuesday starting at 2:15 p.m. ET before testifying in front of the House Energy and Commerce Committee on Wednesday. The hearings will allow members of Congress an opportunity to get a sense of Facebook’s privacy problems – and what can and should be done about them. Facebook shares have been rocked since news of the scandal first surfaced on March 18. Since then, they have lost more than 14% of their value and $US79 billion in market capitalisation. And while the scandal has weighed on Facebook shares, users are staying on the platform. Thill did, however, lower his Facebook target to $US215 from $US230. Facebook shares are down about 13% this year.